Sorry that we’ve fallen behind in reporting these but I’ve been in the middle of moving to Austin. And Wiz Kids has been so generous we’re actually several figures behind so I’ll just focus on the latest release which was The Ravagers version of Warblade. When Warblade first debuted in the New 52 as a villain we were a little skeptical. But in the pages of Ravagers he has really shown himself to do well in the role. 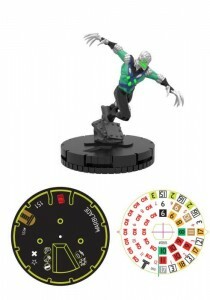 In Heroclix, this version is more deadly than his WildC.A.T.s counterpart. This Warblade seems to have better control of his powers and they represent this by giving him an ability called Shifting Body which allows to him to use both Plasticity and Shape Change. And with the special You Won’t Get Away attack, even running towards hindering terrain won’t help you. They also make sure that his ability to form knives and stabbing weapons is well-represented by giving him Blades/Claws/Fangs and Flurry. In fact, it seems he has something on each click of his dial that will aggravate you whether it be Toughness, Exploit Weakness, or even down to his last click where he gets the always-annoying Regeneration that will give you headaches. He is more than worth the 151 points you’d spend for him. You can find more about Warblade here. Keep watching for more previews! 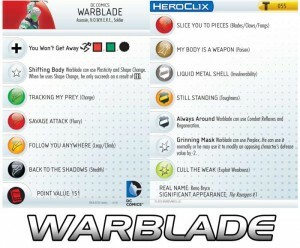 This entry was posted in News and tagged beast boy, brother blood, heroclix, warblade. Bookmark the permalink.